There are plenty of car and passenger ferries to make use of in Croatia. A trip on a ferry is a great way to see more of the country and avoid busy roads and sometimes also, border crossings. You might also want to think about incorporating a ferry into your journey to Croatia to avoid having to fly into Split or Dubrovnik where the flight prices can be sky high in the peak season - have a look at flying to Italy and then getting the ferry over. We can always arrange Transfers in Croatia for you with our trusted local 3rd party suppliers from the ferry port to your villa or perhaps you'd like us to arrange Car Hire so there is a hire car waiting for you when you step off the ferry. You can also catch a Hydrofoil if you don't want to take the car and need a fast transfer. The Hydrofoil is also called the "Fast-line" and for example will take you from Split to Vela Luka on Korcula in just 1 hour 45 mins. We advise you to pre book as they sell out very early – the most popular routes are usually full by Easter. You can now pre-book most of your car ferry tickets and also most of the fast catamaran ones - but other car ferries to the islands are still a case of turning up on the day and buying your ticket at least an hour before hand as it’s first come first served. Please Note: Although currently some tickets can be booked online, this doesn't guarantee that you will get a place on that specific ferry unless you're there early, so you might still have to wait for the next one. If you are catching the ferry from Split Port or a bus from the Bus Station and have some time to spare, it is useful to know that you can leave your luggage at the ‘Garderobe’ at the port Bus Station which is right across from where you get the ferries. You can see where the the left luggage facility is on the map extract below (see red marker) and you can see it here: Location of Luggage Storage at Split Port - Google Street View. It is very convenient as the whole port area is not very big. 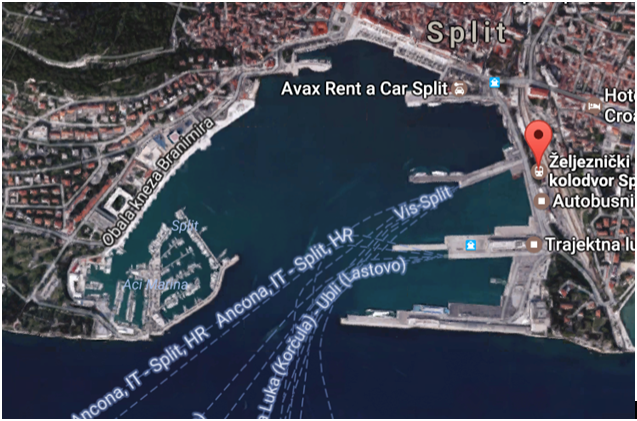 On the image below, just under where it says “Split”, is actually the waterfront promenade (the “Riva”) which is right in front of the Old Town of Split so you are really close to it to do a bit of sightseeing and there are plenty of restaurants and cafe’s all along the sea edge to have lunch or a coffee while you wait for the ferry. It’s all very convenient. You can see that one ferry goes to Korcula for example, from really near the red marker. The link to this Google Map is here - Location of Luggage Storage at Split Port - Google Maps. Or, if you’ve decided to hire a car at the airport what you’d do is drive the car into the ferry queue and then go off for a coffee/lunch etc and then come back about half an hour before the ferry departs, ready to drive on to the ferry. That is what everyone does. Our local Rep can arrange car hire for you also with a local supplier, to collect from the airport – see here -Car Hire in Split & Trogir or we also have a DIY cheaper option that you can do via our website through Rhino Car Hire. To Book Speedboat transfers from Split Airport to Brac Island click here. Brac is not advertised on their website but they are doing speedboat transfers there. You need to get to the ferry and buy tickets at least an hour in advance as it is first come first served (even if you pre-booked). The port is actually at the end of the promenade at Split Old Town so it’s a lovely spot to go for a coffee or lunch while you wait for the ferry. You can then walk or drive on to the boat! It’s only a 50 minute ferry hop to Supetar on Brac Island and all the ferries have sun decks so you can watch everything go by – very nice indeed! They also have lounge bars where you can buy coffees, beers, wine, sandwiches etc and sit inside out if the sun. As an example of prices, it is 160 Kuna (approx £18) per car & 33 Kuna (approx £4) per person (foot passenger) to Brac Island from Split Port. Here is the Ferry Timetable - Split to Brac Island 2018 – there are about 14 crossings in high season per day and they go from early morning to late at night. You can also cross from Makarska straight to Sumartin – there are about 6 crossings per day on this route – Makarska is a small town about an hour’s drive south of Split so you would need to drive or have a transfer there first. Here is the Makarska to Sumartin ferry timetable. There is also an early ferry from Jelsa on Hvar Island via Bol Town on Brac Island to Split returning late afternoon - here is the timetable for the Jelsa to Split ferry. It’s only about an hour direct into Hvar Town via the passenger only Catamaran or you can hop on the car ferry (you can drive on or walk on as a foot passenger) and that takes about 2 hours to Starigrad and then you’d need to drive/get a taxi to your villa. Car & Passenger Ferry - Split - Starigrad (Hvar Island) from Split Port - it is approx 318 Kuna (approx £32) per car & 47 Kuna (approx £5) per person (foot passenger). Catamaran (foot passengers only) – Split – Hvar Town (high season) - it is approx 60 Kuna (approx £6) per person (foot passenger). There are many crossings every day in high season and they go from early morning to late at night. We have Local reps who can arrange and oversee transfers for you at the Split end too (and there are usually taxi’s waiting at the ports on Hvar if you need them) so it’s all very easy and you will be well looked after! Otherwise the fast catamaran from Dubrovnik : www.krilo.hr takes 3 hours and is pre-bookable online Leaves Dubrovnik at 4.30 reaches Hvar Town at 7pm via Mljet & Korcula – goes on to Milna on Brac and ends up in Split a 8.15pm (daily). If you want to make your holiday to Croatia very special, why not fly into Venice and spend a few days enjoying the magnificent history and then catch a fast ferry (passenger only) to the Istrian coast? It's only a few hours between Venice and Umag, Rovinj, Porec, Pula or Opatija – strolling through the Venice lagoon is a unique experience and the ferry journey is very pleasant. Just sit, relax and we will organize your rent-a-car to wait for you on your arrival and take you to your villa! The Coastal Ferry Route 101 will possibly be ready for 2018 season - running from Rijeka to Dubrovnik Mondays & Fridays from June to September departs Rijeka @ 7pm arriving Dubrovnik at 6.30pm following day - to be confirmed. Fridays – departing 4pm arriving 10.05pm. From Zadar it's only 1.5 hours drive to the Split Riviera & the islands or take the Friday ferry, stay the night in Zadar and then choose a villa for the next week – change over day for the area is a Saturday only in July and August (other days might be possible out of season). Departs Ancona 22.00 & arrives next day at 9am in Split harbour. Departure days change from week to week so please check online timetable. Pescara, Bari or Ancona to Croatia. Also they are now selling Jadrolinija catamaran tickets in the UK.